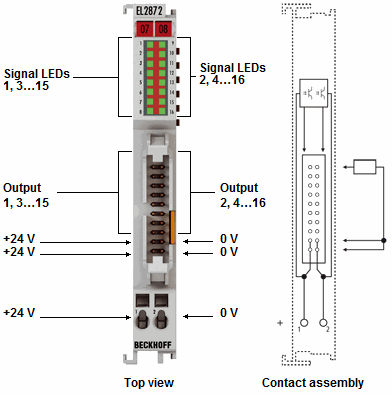 The EL2872 digital output terminal offers a very compact design with its 16 channels. A 20-pin connector enables the secure connection of plug connectors using insulation displacement contact, as is usual for ribbon cables and special round cables. This significantly simplifies the wiring of many channels. State-of-the-art output drivers guarantee minimum power dissipation. 16 LEDs display the logical signal states of the outputs.